Editor’s Note: We previously attributed the transfer option to DuitNow, which was inaccurate. We apologise for any misunderstanding caused and have amended the article to reflect that. A couple of months ago, it was announced that over 40 banks in Malaysia are expected to offer DuitNow, a new electronic payment service provided by Payments Network Malaysia Sdn Bhd or better know as PayNet. Bank Negara Malaysia is the largest shareholder in the company and PayNet is supported by 11 major financial institutions as its joint shareholders. DuitNow is an initiative by Bank Negara Malaysia and is part of their Interoperable Credit Transfer Framework to foster an efficient, competitive and innovative payment landscape in Malaysia. The system allows customers to transfer money securely and instantly using the recipient’s mobile number. Recently, we’ve found that the most convenient way to transfer money is through Maybank’s QR Pay function where all you have to do is scan the recipient’s QR code and key in the amount you want to send. Although it’s pretty simple, sometimes it can be bothersome as both of you have to load up the app to access the QR code (unless you print the QR code out of course). Another way that we’ve been sending money to each other in this office is via GrabPay, where all you need is the recipient’s phone number. 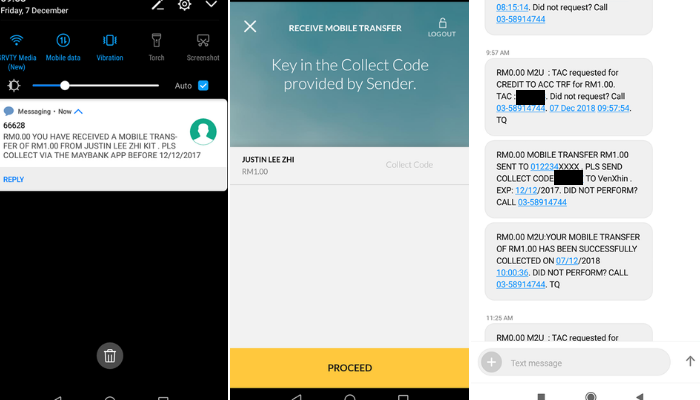 However, we just realised that Maybank has a transfer to mobile service, so we gave it a test today to see how user-friendly it is, before DuitNow launches in Malaysia, so that we can have something to benchmark it against. To test it out, we sent a RM1 transfer to see what the process was like. 1. Load up the Maybank app and click the mobile section, input your password and then click “Transfer via Mobile Number”. 2. Put in the recipient’s phone number and name, then insert the amount you want to transfer (the minimum amount is RM1 and maximum amount is RM1,000). You can also send multiple transfers as long as you have their numbers. You can even have multiple transfers. 3. After that, the sender will receive a TAC code to allow the transaction to go through. 4. The recipient will then get a SMS announcing that they have received a mobile transfer, they will then have five days to collect it from the specified banking app. 5. Before collecting they will need to key in a “Collect Code” which will be sent to the sender. Thus, just forward the text through WhatsApp or SMS so the recipient can collect the money. However, when it comes to Maybank to Maybank accounts, if you’re right next to the person, asking them to load up their QR Pay for scanning and payment would probably be faster. It was previously announced that DuitNow will officially launch by December 8, 2018, so you can probably expect it to be activated in the 44 participating institutions tomorrow. We’re hoping that it will be even more convenient and easy to use; that could potentially revolutionise how we transfer and deal with money in Malaysia.